A new book by Lauren Oliver, yo!! and haven't had a chance to get to it yet. it's going to look great on my shelf!! I am really curious about this. 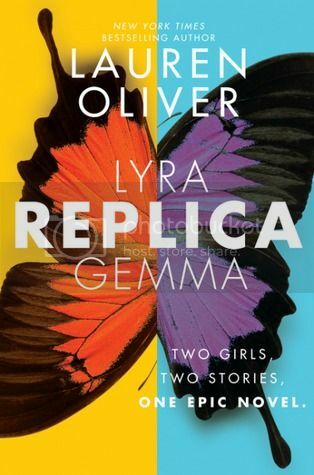 I enjoyed Delirium and some of her contemporary novels so I hope Replica will be good too. Nice pick! Nice! Seeing this around a lot! Hope you'll enjoy it too! I've been considering this one. I've only read 2 books by Lauren Oliver. One is on my fave shelf and the other is on my 'meh' shelf. I'm waiting for reviews on this one. Hope you enjoy it! Great pick! I was really excited to receive an ARC of Replica at BEA. I plan on reading it closer to the release date, which isn't too far away now. I hope you enjoy it!! I'm planning to start this one next! I'm so excited. I love Lauren Oliver's books. I like the concept of this one, that you get the stories of both girls. I hope you enjoy! This one is on my list. Enjoy!